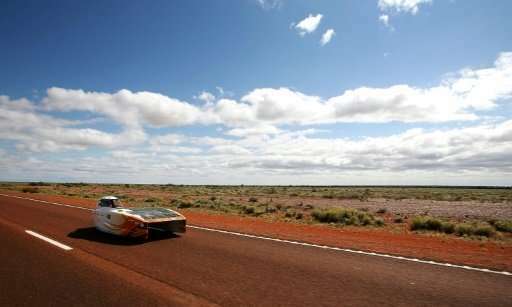 Dominant Dutch team "Nuon" Thursday won an epic 3,000-kilometre (1,860-mile) solar car race across Australia's outback for the third-straight year in an innovative contest showcasing new vehicle technology. Cheers and chants of "Nuna" roared from the large Dutch contingent as the "Nuna 9" car—travelling at an average speed of 81.2 kilometres per hour (55.5 mph)—crossed the finish line mid-afternoon. "Welcome to #Adelaide @NuonSolarTeam, winner of the @bridgestone #BWSC17 Schneider Electric Challenger Class," race organisers tweeted. The US' University of Michigan "Novum" was on track for second place ahead of Belgium's Punch Powertrain. How was the average speed calculated? 3000km/37h = 81.1 km/h and they took 37h 10 min 41 sec, which gives 80.7 km/h by my calculation. The actual distance was 3021 km @ 81.26 kph. The actual distance traveled can be defined in many ways, because the cars can weave about the road or take the straightest paths. For example, if there's a headwind, the driver may choose to tack the vehicle against the wind to gain a bit of its energy, but as a consequence the actual road distance will increase - so the odometer reads longer than the actual road. Exact distance of the solar challenge is 3022km. How daft.. when Garrett in US in 1935t(!) patented in-car produced hydrogen to fully power the vehicle, using palladium and platinum electrodes in distilled water with an electrolyte. In US Stan Meyer patented his 'system' running a beach buggy on hydrogen from electronic pulsing in stainless steel electrodes in an electrolyte. He was murdered in 1998. Please somebody tell me that when we can analyze mineral samples from Planet Mars, out brilliant scientists cannot efficiently split a water molecule. 81.2 kilometres per hour converts to 50.5 mph, not 55.5 mph as is stated in the article.